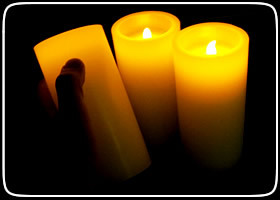 battery candles – ActiveDark.com – Glowing Ideas! 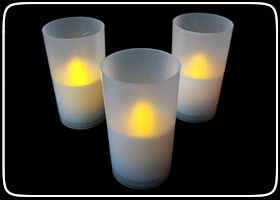 LED Flameless Candles have become a very popular product line spanning over various shapes, sizes and types recently. LED Candles are not only imperative for creating great center piece and mantle displays but also offer a very important safety aspect. No open flame or fire! With many reception halls, banquet halls and churches not allowing true flame candles. LED Flameless Candles are a fantastic replacement for standard wax candles for weddings, receptions, holiday celebrations, bah mitzvahs and any other event that candles may be a tradition for. Many modern LED candles offer flickering LED lights that replicate a true flame built into a real wax candle. It takes a very close inspection to even tell that they are not real candles! Flameless Candles also make great holiday time products for both festive decorations, for gift exchanges or stocking stuffers. From simulated Tea Lights and Candles with Votive to Large style Pillar Candles. LED Flameless candles are an essential festive product!